Please visit Lodge History page to read about the fascinating beginnings of our Lodge and an insight into Masonry’s Origins. All of the Lodge Meetings and Events can be found on our Calendar. The Lodge contact form and Officer details can be found in the Contact Us section. If you are interested in Freemasonry please read our How to Join article. Other tabs have subtitles with pages worth reading and looking through. Under News & Articles tab find many WORLD FAMOUS Freemasons names. This is a very simple 4min video of Freemasonry in New Zealand, you will be impressed. Or you can watch this very enlightening “Face TV” interview of our Past Grand Master, MW Bro John Litton. 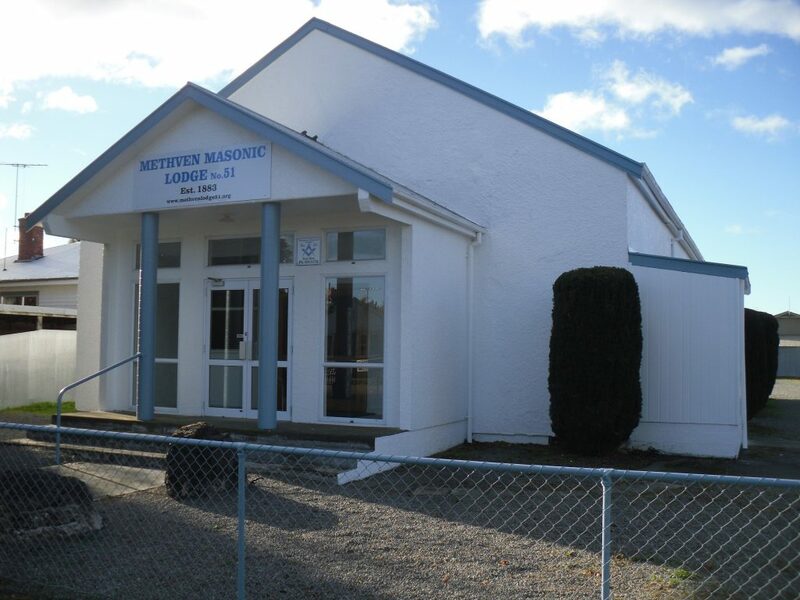 The Methven Masonic Lodge #51 at 4 Chapman St Methven is the oldest active community organisation still operating in the Methven region, being founded in 1883. Over all the years to this time it has had many prominent community leaders as its members. Many going on to higher rank in the organisation. 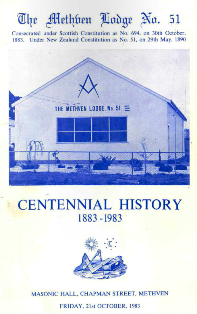 You will find on the history page here, or down the RH side column, a CENTENNIAL BOOK with detailed years of activity all of which will be found as genuine METHVEN DISTRICT history and the development of the community we have here today. Each of the 40 pages can be read in this booklet. In it will be found: the regions bank managers, post masters, railway station masters, engine drivers, guards, storekeepers, farmers, stock and station agents, fat lamb drafters, clerks, doctors, stable hands, school masters, teachers, ministers of religion, blacksmiths, policemen, butcher, drapers, builders, bricklayers, saddlers, hotel proprietors, bushmen, shepherds, teamsters, a jeweller, mechanics, chauffeurs, accountants, boot makers, contractors, dentists, hydro power station workers, military personnel, plumbers, tractor drivers, engineers and the many others who all go to making an active community work. Away from Methven and into the big wide world you will find members who are: Royals, Presidents, Governors, Prime Ministers, many prominent Community Leaders, prominent Business Leaders, Military Leaders, Cardinals, Bishops, Priests, renown Musicians and Poets (Mozart, Robbie Burns and Beethoven), Actors, and many others in the top echelon of the world’s people and leaders. See under News & Articles tab for many names of Famous World Freemasons they all thought highly of the organisation that they desired to become members of this big international organisation. In regions such as South and Central America, the Philippines and Spain The Masonic Lodge is dominated by Roman Catholic Church followers, as in the Middle East by the Islamic faith, and the same all around the world, with the many different religions and beliefs. So it can be seen as catering for all business, political and religious persuasions. THE METHVEN LODGE #51 Building at 4 Chapman St. Still meeting in the original building in Methven, where Masons of the region have met since 1883. As above, it involves people of all walks of life, all enjoying the fraternal friendship the ancient organisation has offered over many centuries. A fraternal organisation which is non-religious and non-political, in fact discussions of religious or political nature are banned from within its organisational structure. 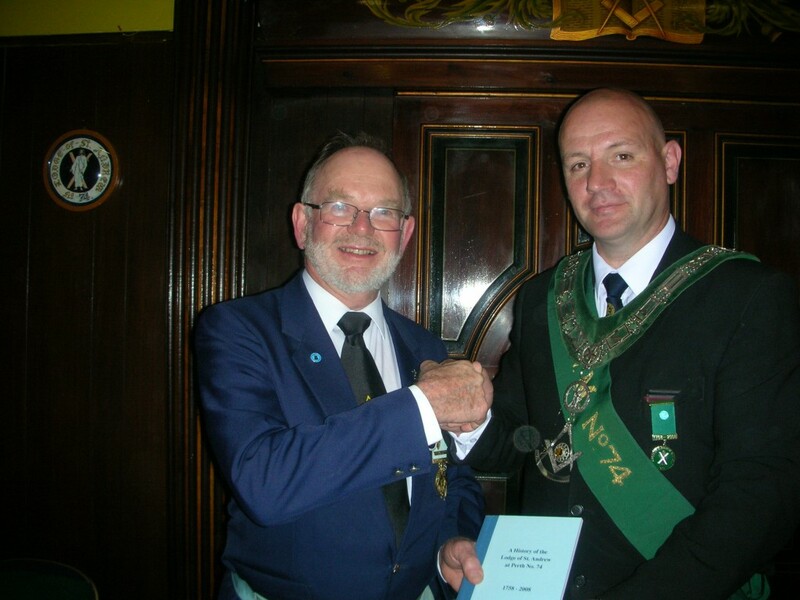 W Bro George Currie Receiving a Copy of the History of the Lodge of St Andrew #74, 1758-2008 (250yrs) in Perth, Scotland, from their RW Master in Sept 2011. It is truly international in all respects. It embraces all religions and political proponents. Peace, Love and Harmony are 3 precepts which direct members. Brotherly Love, Relief and Truth are the 3 tenets of Freemasonry. Temperance, Fortitude, Prudence and Justice are its 4 cardinal virtues. To have these features among men all around the world goes a long way to cultivate Peace and Harmony among the world’s people. The Methven Lodge No. 51 | Powered by Mantra & WordPress.